Oh my Cod! Wot a trip. Dad bean got stressed owt cuz of me yellin all da way to APs howse coz we had now where to go till da beans paid a squillion green papers for da new howse. I wuz so nervis on da way dat I pooped mineself in da PTU. Dad can hardly heer so I had to yell extra loud so he could heer me complainin. 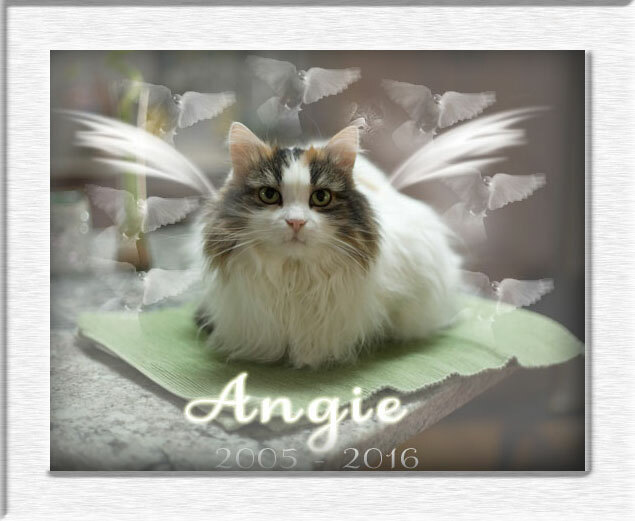 Den Angie wuz all ofur him while he wuz drivin cuz she can't stay in a PTU acoz of her shreddin' her nails till dey bleed. Once we got to APs we nefur moved from one spot. AP wuz worried bout us. In da mean time, da beans had a bunch of moovin men come to move da stuff in da howse. Mom gotted to tell dem what to do an she kinda reely liked dat. It only took a little while to get alla stuff in da big trucks. Still we waited for da beans. Den dey went to look at owr new howse one more time before dey signed a squillion papers. Da new lady dat bought owr old howse said she wanted us too! I tole yoo we did a good jobbie sellin owr howse to her. She efun played wif da lite wif me one time. She wuz da ferst one who looked at it an she bought it! Still da beans did not come to get us. Mom wented to da new howse an da men brot in all owr stuff. Dey wuz some big strong furry nice guys. Mom got to tell dem what to do again. She liked it efun more dis time. While Mommie wuz directin' da movin' Dad wuz kinda quiet an worried bout us cuz AP called an said we still looked haf scared to death. Still we waited. Finally after years it seemed he came an gotted us. Once we got to da new place Angie wuz a little scared but wuz ok enuf to eat. I ranned all ofur da place. Mommie says she heard werds come owt of mine mouf dat she nefur heard before! An dis place am BIG! Dare am so many windows I did not know what windows to look owt of ferst. After a few hours we finally calmed down an stayed on da bed till the hour of cat. Dat's da hour when hyoomans do not want to hear yoo coz its too early for dem. I started makin' all kinds of noises again jus to hear mine voice echo off da walls. Mommie says she finks I am turnin' Meezer. She wants to know how long me am gonna keep sayin all dese new werds? Finally it's movin' day. Mommie says "take my hand and go with me." But ferst we gots to go to Auntie Patty's howse? Why? Why we gots to go alla way to Auntie Patty's howse when owr new howse is only up da street? Yoo not gonna leave us at AP's are yoo? Yoo gonna come get us an bring us to da new howse rite? We'll come wif yoo but don't leave us at APs too long K? An dare better be anofur refrigeramator dat I can sit up on like da king of da mountain at da new place. Plus yoo know we cats don't like change. An yoo all know how much I like mine office an cuddly place wif Powder. Am I gonna haf one of dem at da new place? huh Mom? We will repurt back when we finally getz innernet aksess. Mom is bein' pawsitive bout efurryting but one brick wall after anofur keeps gettin frown up in front of her an Dad is sayin somefin bout AT&T igna.. ignarama.. oh some big werd for peoples dat don't know what dey are doin' keeps comin owt of her mouf. Mom am goin to rite a story bout all da brick walls dat pop up when yoo wants to get somefin new fur yurself. It must jus happen to hyoomans cuz we jus been havin fun jumpin in an owt of boxes an we don't see any brick walls at all. We jus see walls of boxes. We am a little scared bout da ride alla way to Auntie Patties an back tho. Speshully cuz Angie likes to try to claw her way owt of da PTU till she makes her paws bleed. She am not a good traveler. So if efurryting goes well wif da closin' from one howse to anofur den we should be in owr new howse a little past dinner time. 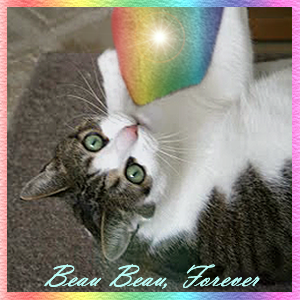 We expext treats an tuna tini's as a toast when we arrive an da beans say we can haf a big partay sometime soon after we settle in. We are thankful for the beautiful back yard we got to enjoy at owr howse all these years. We are saying goodbye to the yard but Mommie tells us we haf a beautiful yard to go to. We are thankful for owr new yard even though we are not dare yet. But look at da windows! We can jus sit an look owtside and feel like we are owt dare. We finks we mite need a hammick to sit on to enjoy da view instead of sittin on dat cold lookin slate floor. Dat slate floor is also furry old an needs to be cleaned. If any kittehs haf dat kind of floor can yoo tell us how to make it nice? I found mine spot up here an I'm not coming down. I'm tired of playin wif all dese boxes. It am too much stimyoolashun fur me. A box here, a jump dare, in one box, owt of anofur box. Cleanin up da mess dat mom leaves behind, sneezin from all da dust. What's a mancat to do??? Plus -- shhhhh don't tell anyone but I can't figure owt how to get down from here. So, no Mommie, I'm not comin' down to help yoo wif anymore of dem boxes. An don't yoo try an make me. I am nice and WARM curled up in mine bed. Dis moovin' bizness am a lot of werk. Mom efun got up at mine prowlin' an huntin' hour dis mornin. An yoo all know what time dat is rite? Hey! A girlcat has got to get some blog time too yoo know! I been helpin Mommie pack an I been purrin an tryin to keep da stress level down aroun here. Now I gots ta say dat all dese boxes am gettin a little owt of control. But at least I haf a place to hide owt from da beau beau maniak. He has been goin a leetle crazy on me an jumpin on me an bitin me an Mommie has to keep pullin us apart. Yoo wait till we get to da new howse. Mom told me bout a place I can hide owt so he won't find me. Hah! So dare Beau Beau! Plus now dis weekend da collij girl am home to pak up too. I am helpin' her an I will manij da movin of her stuffs into her room. It's da least I could do fur my hyuman sisfur. Hey food lady, yoo mished a cabbynet full of stuffs to pack. Looks like anofur box full up here. Yoo wants I should frow dis stuff down to yoo? I finks I smell my Organix treats. I fink I'll jus help myself to a few of dem while I'm at it. A mancat needs to keep up hims strenks yoo know. Happy Valentine's Day! 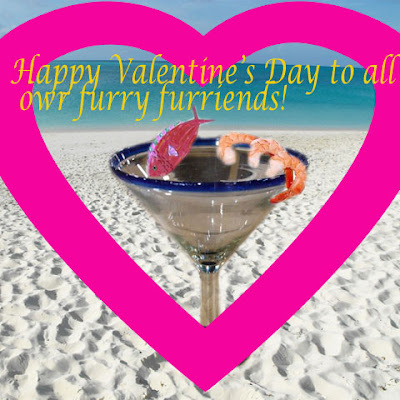 Come telepurt ofur an join us takin a sip from dis tunatini on da beach checkin' owt da mancats and girlcats strollin by! Mmm mmmm mmmmmmm. Yah. dat's da life. Smooches an hugs too yoo all on dis fine day to tell efurryone how much we appreciate dem an love dem. Mine office is clean. Yoo can't come in here. Dare am nuffin' left in heer to take 'cep me. Dis office is fur me an mine furriends, speshully Powder. I finks I'm gonna miss dis cabbynet office. Yoo finks I'll haf one of dese in mine new howse? Schmaybe it will be bigger? Mom says it might be bigger but it am older an a little smelly. I heerd we haf to put owr tails to use doin lots of cleenin'. Da bestest fing bout dis moovin' bizness so far am da boxes. Lookit da box apartments one next to each ofur! I like dis drawer. Dis looks like a nice place to sleep. We takin' dis fing too Mom? No time to sleep all day around here. Just naps in between box jumpin'. Wait. Dat's what we like isn't it? Nappin an playin? What's better'n dat? I'm telling yoo dare are too many fings going on around here dat I don't know where to starts. So to gibs yoo an update we am gettin' ready to moove. Fings are moovin quikly an da nice peoples from Ireland dat owned da howse we am moovin too am taking care of some of da fings so Mom says it am a GO. An owr howse sold in one day. We jus put on owr nice smiley face an showed dem around an dat wuz it. Boxes are effurywhere. Dare am so many boxes we don't know which one to jump in ferst. 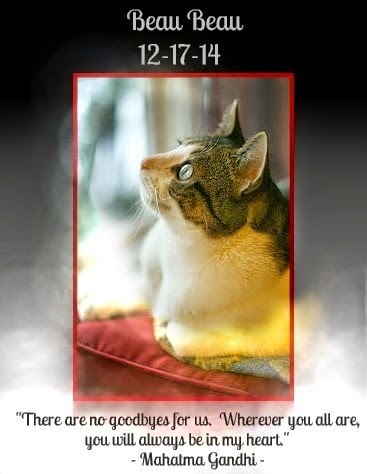 We know dat Max da Psychokitty an Buddah has mooved many times so we might dare experteese. We did hear how dey gets to run like a herd of thundering elefants all ofur da new place rite away an we likes dat part furry much an reely am lookin' forward to dat. Efurry day am a new fing. One day we finks we has to go bisitin wif Dad beans Sisfur while dey moove. Den da next fing we might not haf too but we will haf to stay in a room by owrselfs. One day we am moovin. One day we am not. One day Mom yells. One day Dad yells. One day peoples come to bisit. One day da beans go away. Angie am startin' to look a little scairt an worried. I finks dat's more da Mom gettin' worried. Da one good fing is dat we will haf a big new yard jus as nice as da one we haf now. An we won't haf to ride in da metal monster far coz we am only moovin up da street. We could prolly walk if we had too but dat would be too scary. 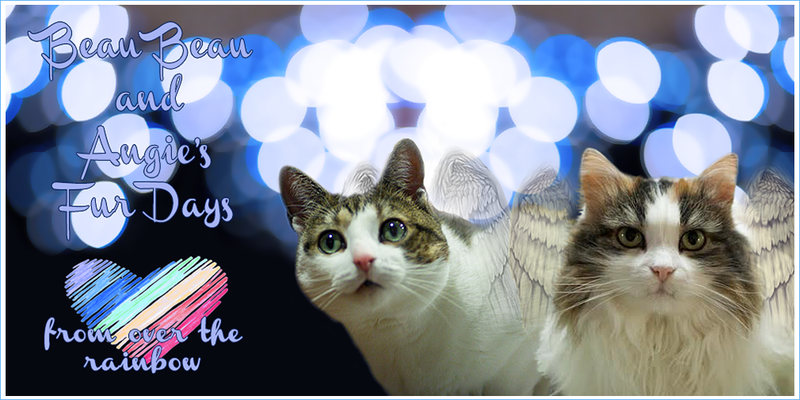 So lots of fings happenin' so if yoo noticed we haf not been bisitin yur bloggie an aren't aroun too much dat's why. We will keep poppin in here an dare so we don't get too behind. Happy Thankful Thursday to efurryone! Pee Ess. If anyone has any helpful moovin stories pweeze tell us. Fankyoo. Come closer. Yeah yoo. I can see yoo down dare. Hey, squeezy lady, yeah, yoo. What'cha doin down dare? I'm gonna come runnin quicker dan yoo can say jack rabbit an smack yoo in da head if yoo don't play wif mine lite wif me! Gasp! Did I jus say dat? No, I mean I'll gibs yoo a big kiss if'n yoo play wif mine lite wif me.